I do not have the credentials to offer welding advice. The welding experiences that follow, and any I might offer on this web site in the future, explain how I chose to approach a modification I wanted to make to my personal vehicle. I am not suggesting that anyone else make use of the welding techniques and modifications mentioned below. 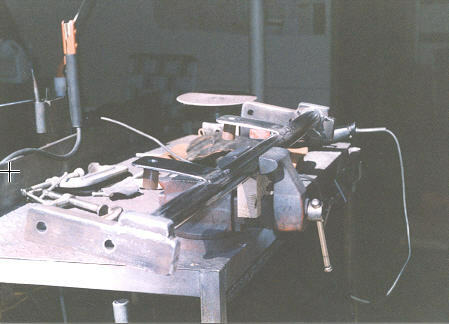 In the event anyone chooses to accept the responsibility of initiating similar welding techniques and modifications, they should do so with the understanding it could result in undesired damage to their vehicle and could void the warranty provided by the vehicle manufacturer. In addition, I wish to point out that undertaking any vehicle modification without proper knowledge, experience, tools, and safety equipment can result in personal injury. We all have to learn somewhere. Taking a tech school welding course is an outstanding way to get on board, get the technique down, do it safely; and by the time you finish, you will have more than enough experience to make the proper welder selection. Here is a good basic explanation of the different types of welding rods used in "stick welding" (e.g. E6013, E7014 and what the numbers mean). Heat Treating (annealing/hardening/tempering) Metals provides a brief overview of how the characteristics of steel are altered by heating and various methods of cooling. This is a subject in itself and and something to think about in deciding what you are, or are not going to weld on a vehicle. If you want to learn more about metal working in general, check this site out. Once you have the skills to weld, there's another set of skills that need to be developed. Many people appreciate custom fabrication, but few attempt it. In order to build anything, you need to be able to visualize the end product, then work backwards identifying all the parts that go into the complete assembly, how they themselves will be fabricated and assembled, and while using only the limited tools that most of us are likely to have. Sometimes it is not immediately obvious how to do things and, correcting mistakes made with steel can be difficult and discouraging. All this can be a very tall order for someone just starting out, and most of us are not lucky enough to have someone around that is experienced in metalworking. Based on my personal experience, the book shown below will go a long way in teaching you a lot of what you need through its clear explanations, lots of pictures and drawings of how to build good looking, structurally sound parts. You can start out making parts which require minimal experience and ability, then progress as your skill and confidence grows. 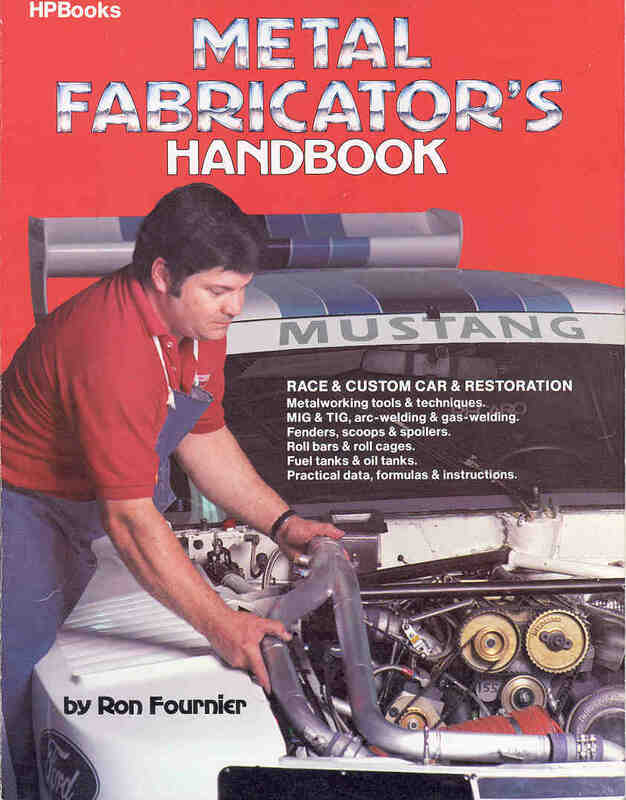 The first edition copy I have, published in 1984, has been a very helpful reference, especially the chapter on "Roll Bars and Roll Cages". This section contains not only the must-know information critical to construction of a safe roll cage, but also information that would be helpful for any tube construction whether it be sliders, bumpers or other common 4x4 mods made of steel tubing. Per current book reviews on the Internet, this book is still at the top of the list for its subject area. If you'd need a source for current edition of this book, click on the image below. Build yourself a welding table! You'll thank yourself for doing this on every project that follows. This one was built totally from junkyard scrap, except for the vice. A few of the features include, welding rod storage underneath, casters so I can roll it to the open basement door for good ventilation, heavy steel plate at back side of the table, carefully aligned 90 degrees from table top (good for clamping stuff to for accurate corners) and of course a vice.. that's a must have! If you put casters on the table, you will also need some kind of braking mechanism to lock the wheels so the table won't move around while you are trying to weld or use the grinder. Plan on buying lots of clamps, you never have enough! One other thought, you want plenty of fresh air in the area while you are welding. In addition to the garage sized, open basement door, I have a 1300cfm fan mounted overhead that comes on automatically when the welder is turned on. Even with the concrete floor, walls, and no flammable materials or liquids stored in the area, it's a good idea to keep a water hose handy right by the table. I have sometimes used this on non critical steel parts to cool them after welding, but as I've learned the hard way, this will temper the metal and can make it very difficult to drill through. If you skipped reading the link above to Heat Treating (annealing/hardening/tempering) Metals, now's a good time to read it! Every so often, questions come up on the 4x4 Forum on what type of welder one should buy. There seems to be a tendency to jump right into MIG welders, which are nice, and overlook stick welders. There are pros and cons to each type. Stick Welders have a lot of versatility in terms of weld depth. e.g. E6011 rods available for deep penetration, E6013 for less penetration, E7014 for high fill 70kpsi steel and a variety of rod diameters are available to match metal thickness. They can penetrate deeper than MIG , unless using big (expensive) MIG and, are better suited to heavy (thick e.g. 1/4" and up) metal construction. They easily handle welding dirty, rusted steel and is cheaper to purchase a AC/DC stick welder than comparable sized MIG Machine. 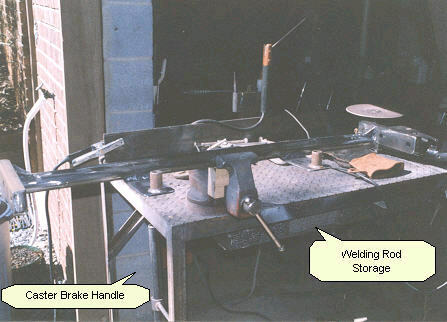 Stick welders perform well in windy, exposed conditions; no problem with shielding gas (from rod coating) blowing off weld. Welding rods are small enough and can be bent to shape needed to get into tight areas. You have to spend more time cleaning the slag off the weld, and it is more difficult to make "pretty welds" compared to MIG. It is also more difficult to weld thin metals e.g. 1/16" or less without burn through. With MIG, it is easier to weld thin gauge metals and make a more attractive joint appearance. With the continuous wire feed, they have the ability to make continuous seam welds (w/o having to stop to change welding rods). They are also well suited for body sheet metal welding. MIG Welders are more expensive than for a comparable power level on a stick welder. If you buy lower power level MIG, then you are more limited in the thickness of metal you can weld (limited by penetration needed). The metal to be welded needs to be clean (e.g. no paint, rust scale). Difficult to use in windy conditions due to shield gas being blown off weld. MIG gun can be too large to get into tight places, which can made on-vehicle welding difficult. What's a Suitable Sized Welder for typical 4x4 vehicle mods? In the end, one needs to decide what size projects you are going to take on, to judge the acceptability of a light duty versus a more heavy duty (current capability, duty cycle) welder. There is another consideration to think about. If you need an emergency standby power generator (and live in an area where the noise from running is not a problem), then engine driven welders make nice welders and emergency generators. When I did my rock slider cradle frame, I decided it was time to get a good auto dimming helmet. The SpeedGlas 9000x was not cheap, but with the close quarter tack welding that had to be done, one errant strike by a welding rod could easily pay for the price of this helmet in terms of damage to the vehicle... I get really nervous around aluminum e.g. radiator core, A/C condensers, not to mention gas tanks and lines.... One strike especially on the aluminum parts, would make a very expensive hole. In addition to knowing where my welding rod is at all times, I cover this stuff up with sheet metal scraps and rock wool insulation bats that I keep around for that purpose. The SpeedGlas 9000x with the big center lens, side window lens, and adjustable shading, is very nice, but the adjustable triggering threshold and a breathable, well ventilated helmet design is what keeps it from being a major pain when welding on a bright, sunny, hot day.... Hard to appreciate unless you've had sweat rolling down into your eyes, and a fogged lens from your breathing on a hot, humid day..